This is a simple (patchy) record of my comings and goings, but if that's your sort of thing, knock yourself out. I thought that if I titled this post like an episode of FRIENDS, it would have more appeal. Here it is, the promised post about motivation and fitness. I'll start with this one idea: one is a product of the other. In fact, either can produce the other. This should become clearer as I explain. I'm going to lead you on a little trip: it's the story of how I found my motivation. I don't pretend to be some fitness guru or even close to being in great shape. What I can say, with confidence brimming, is that I found a start to the journey! What had I changed? My junior year I started running, and my senior year I added football to my activities. The daily cardio-burn really helped me shed the pounds. That was a very positive feeling, and I learned something from it: I have the potential to change. I didn't have to abandon hope and accept my belly-flab as my constant companion. So, I had lost weight. I look back at pictures, and I can see it in my face: I look more lean. However, the mid-section still held onto that stubborn flab. Once I left home in the individual pursuits of the next few years, running became less of an option (especially in Canada) and football was a thing of the past. I slowly regressed into the 210-220 lb. range (thank you, MTC Cafeteria). Since returning from the mission, I've had spurts of motivation that have led me to the gym pretty consistently to run the treadmill or use the elliptical machine, but it never made a huge difference for me. 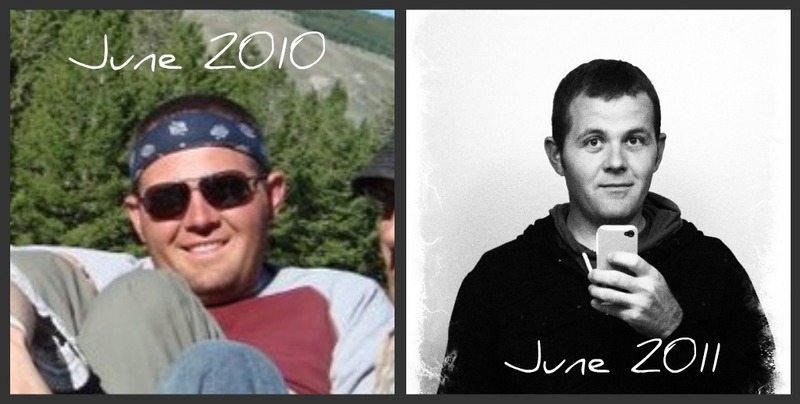 My weight would fluctuate, but I'd never get any promising results and my motivation wavered. Let me fast-forward to this year. 2011, January. I was off-track, in Arizona having the time of my life being with family and friends. The holidays at home provided a great dosage of rich food, then I moved to Queen Creek to live with my brother and sister-in-law. I worked with my brother for a bit, and our most convenient source of food was the entire imaginable gamut of fast-food chains. We also thrived on caffeinated soda to keep us running steadily through the long work-days. I didn't have a scale handy at the time, and was happy to avoid one. I didn't like eating that way, but I lacked desire to do anything different. Then I stopped working (yeah, it happens to college students from time to time). Suddenly, I had some time to do things. I could read, I could nap, I could walk the dogs, I could visit friends, watch movies, shop, eat, laugh, cry, ponder, spit, hike, breathe, or make funny faces in the mirror if I wanted! This was actually the best thing that could've ever happened for me at that point. Perla had been talking about P-90X. I wanted to try it, so one day we planned to get together and do Yoga. (Yoga isn't for everyone, but I LOVE it. The best de-stressing mechanism for me. Moving on...) Once I had a taste of work-out time with Perla, it became a regular thing. We'd decided a time, we'd get together, and we'd work out. On days when we weren't, I would always go jog the running trails that go through the neighborhood (and they are AWESOME!). I decided to cut all soda out of my diet and to really avoid fast food and sweets. Perla and I also did some looking into foods that are nutrient-rich and low-calorie and started getting creative with including them in my diet. Things were changing. This was the start of a journey I wasn't even aware I was on. My weight-drop wasn't drastic, but I started to see subtle signs of a leaner physique. I want to point out that 1) motivation got me started and 2) improved fitness fueled my motivation. Let point out some other key factors here: in high-school, my weight-loss was due to cardio alone. Quit or reduce the cardio, and fat will start taking up residence like you've just refurbished its dwelling. I've since learned that a great combo for long-term leanness has three key elements: cardio, weight-training, and eating right. Let me explain why, and then I'll get on with "the rest of the story". Cardio burns calories and results in a slimmer build. But weight-training builds muscles. More muscle mass in your body means more calories/nutrients are needed to sustain the body, so the calories you do take in are being used -not stored as much. And proper eating even further limits calorie intake so that you get more nutrients and less junk. Summation: you can fight calories from 3 different angles. It's a triple-combo that brings more satisfaction than any combo meal at Burger King ever will. So, in April, I came back to Rexburg for school and I got a screaming deal on a gym membership (seriously, it's 10-dollars a month with no contract). I weighed in at 212 lbs. when I got here. Since then, I've dropped 12 lbs. I remain right around 200 lbs. as I swap muscle mass for fat. Every week, I see new changes for the better. I wear a 32-waist now, and that just thrills the heck out of me (thrift-store shopping possibilities just increased!). I try on shirts, and they fit me really well. I can look in the mirror with real satisfaction and smile at what I see. I do that every day now. Looks aren't even the best part. I feel so amazing! I keep kicking myself for waiting so long to feel so good! Prior to my changes, I felt sluggish most of the day. I could do what I needed to do, but felt like a nap was what I really needed most. Now, I am energetic, much more happy, and I feel things much more! When I laugh, I feel the emotion, not dulled by any bodily fatigue. When I am moved to tears, I feel that emotion in its fulness. When I feel joy, I really feel like I'm brimming with goodness. My body was made to perform! Let me emphasize that by repetition: My body was made to perform. It seems to go against our intuition that a tired, worn-out body would benefit by added activity. But it does! My friends here at school have noticed the change in my mood and behavior and will frequently ask me what energy drink I'm on. It's fun to be able to respond, "LIFE!" I seriously feel that I have been physically reborn. I have a new and different frame. I have defined muscles. I can see that there is a frame under the layers of flab that were once there. I see the veins that operate to send nutrients to the ends of my limbs. The body is an amazing machine, and it is made to perform. The reason that I have taken the time to write this down is 1) I need to record these thoughts for later, 2) I have learned a lot through this process and feel obliged to pass it on, and most importantly, 3) I hope that my insights can serve as a spark to make some changes in your own daily routine. *I am not trying to brag. I know that you are many things: parents, students, teachers, employees ...and it is a real challenge to find the way to bring fitness into your life even when the motivation is there. Start with eating right. That's one of the biggest favors you can do yourself. Eat often, and eat the things that are good for you. Learn to turn down sweets. It's an un-American thing to do, but it's so good for you. I can stand confidently and say that every person reading this has the potential to change. Some things are out of our control. We can accept that. Our personal fitness is completely in our own hands. Now, if you're serious about this, here is your first assignment: find your motivation. Here's how I found it: I went to Vegas, we took pictures. When I came back, I was really not pleased at all with how I looked. That got me started. The progress I see along the way keeps me going. Find your motivation, and start your journey -even if it's small steps in the start. Our bodies are made to perform! Love that thought that even though we may feel too tired to excersise, we really will feel more energized when we do. Also I wonder how much "feeling" I may be missing...I might not be aware I have dulled and tired emotions. I wonder what other great things I may feel when I get rid of them. eSteVEN! I am so thankful I had the time today to catch up on your blog. I love it. And you. Especially at night, and late... this was fantastic. I too have been feeling a little need for change. I always keep it up for a while, but have never felt fully confident in my body. I always feel my best when I am working hard and seeing (although usually small) changes. I am hoping to keep up with the motivation I have found lately. I need you to keep me encouraged! Let's go back to Vegas soon and show off our hot, confident, energetic, full of life bodies, yeah? I am inherently witty, wise, and find great humor in life; I occasionally find time to write about it. ©Steven Hansen 2011. Awesome Inc. theme. Theme images by PeterJSeager. Powered by Blogger.